Has April been the cruelest month of Donald Trump’s presidency? Or simply the most absurd? After 100 days of grotesque gaffes and gross ineptitude—of watching a claque of unskilled oafs hurl up chunks of half-digested policy like a bunch of teens on a Tilt-a-Whirl—it can be hard to tell where tragicomedy ends and true horror begins. Does it start with that slice of beautiful chocolate cake that so pleased the presidential palate as a fleet of Tomahawk cruise missiles carried out his command to pound a Syrian airbase? Or with the tax-code overhaul that promises to bankrupt the federal government while bloating the Trump piggy bank? What about with the newly minted Supreme Court justice who celebrated his ascent to the nation’s highest bench by sending a man to his death? The mind reels. Mercifully, far from the centripetal cruelty of the Beltway, a very different America is emerging, one steeped in humanity, decency, and sanity. This is the America of the counter-Trump resistance, and while it can be found in all corners of the country, its bases are the cities whose residents say “NO!” in a thousand different ways every day to the new Trumpian order. It was in a city, for instance, that just the other day a leading elected official—New York Mayor Bill de Blasio—proposed ramping up the fight against education inequality by offering free, universal preschool for 3-year-olds. (Take that, Betsy DeVos!) It was in cities that swarms of scientists, nurses, physicians, and their supporters marched for scientific inquiry and evidence-based policy. And it was in cities—nearly 65 of them—that elected officials doubled down on their commitment to protecting vulnerable immigrants by signing an open letter to Trump and Congress vowing to defend their cities’ sanctuary policies. Here, for the first time, The Nation, in partnership with Local Progress, offers a sampling of some of the efforts at municipal movement building and progressive policy-making that have burbled up in cities this past month. Few, on their own, will shake the earth hard enough to undo all Trump’s damage or roust the president from his White House perch. But one by one, they are marking out an alternative vision for this country, building a path to a different future. Welcome to the April (and inaugural) edition of Dispatches from the Urban Resistance. As Trump relentlessly tars undocumented immigrants in the press and transforms our country’s immigration system into a deportation force, cities are throwing pesky obstacles in his path. On April 17, the Seattle City Council unanimously voted to create a legal defense fund to support those snared in Trump’s immigration dragnet. Among other things, the new fund will provide community groups with $1 million in grant money so they can hire defense attorneys for locally based immigrants caught in deportation proceedings. The Boston City Council also held a hearing this month mulling the creation of an immigrant defense fund. In Baltimore, meanwhile, civil society has stepped in to fill the void. On April 20, civic leaders affiliated with organizations like the Open Society Institute and the Baltimore Community Foundation announced the creation of the Safe City Baltimore fund. It aims to raise at least $500,000 to aid undocumented immigrants in the city. New York City pioneered the first city-sponsored immigrant legal defense fund back in 2013, and the model has since been embraced as an increasingly popular tool for providing crucial relief to those entangled in immigration court. A 2016 study by the American Immigration Council found that immigrants with legal counsel fare much better in deportation proceedings than those without the support of a lawyer. Indeed, they are four times more likely than their counterparts to be released from detention and 10 times as likely to apply for asylum. Want to help hamstring Trump’s deportation police? Want to make our lily-white attorney general red with rage? Support a local legal defense fund near you. Though it has garnered relatively little press coverage, the #NoDAPL divestment drive is still chipping away at the bottom lines of pipeline-loving corporate giants. In the last few months, cities like Seattle, San Francisco, and Santa Monica, California, have all committed to severing their ties with the Wall Street banks that help finance the Dakota Access pipeline, or DAPL. 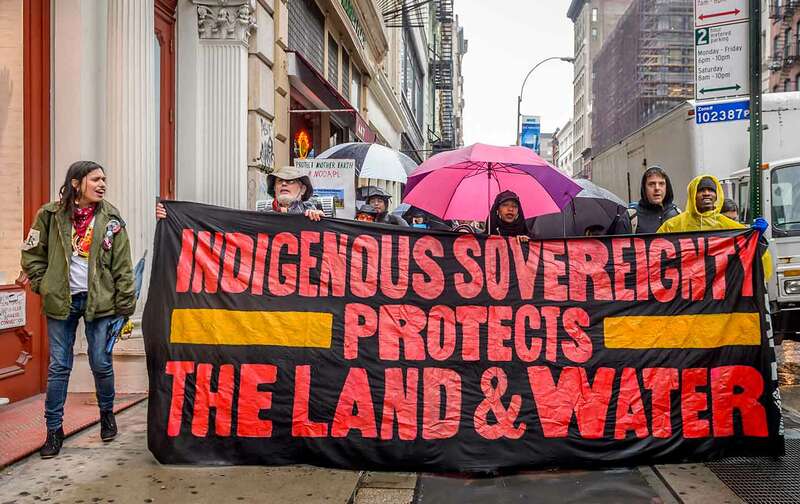 Activists in New York City hope their local leaders will soon follow suit. On April 5, a coalition of indigenous organizations borrowed a tactic from their North Dakota comrades and spent the night camped out in front of a downtown Wells Fargo branch. The next morning they marched to City Hall, where a slate of speakers, including Gloria Steinem, called on Mayor Bill de Blasio to divest city funds from the enormous bank. Wells Fargo has a large stake in the DAPL and, though the mayor has expressed support for divestment, he has yet to take any concrete action. Far away from the dense high-rises and roaring streets of Manhattan, a different sort of city also took a defiant stand against the DAPL this month. On April 3, officials in Missoula, Montana, a mountainous college town nestled in the northern Rockies, voted to divest the city’s funds from Wells Fargo. While Missoula only has about $2.6 million deposited at the bank, its decision adds one more name to the growing list of municipalities punishing Wall Street for profiting off of fossil-fuel infrastructure. Even in a right-to-work state like Texas, even in the midst of the Trump era, labor unions can gain ground. In Austin on April 6, airport workers scored big when the City Council passed a resolution that requires concessionaires at its international airport to enter into “labor peace agreements” with workers there, most of whom are represented by UNITE HERE. Any company that hopes to operate a restaurant or shop at the city’s rapidly growing airport will now have to agree to stay neutral if and when their workers decide to launch new organizing drives. In return, workers agree not to go on strike during their unionization bid. The resolution also directs city staff to search for other kinds of municipal contracts that could be amended to include similar peace agreements. Labor peace agreements are an innovative tactic and meld the legislative power of city government with the people power of labor organizing. They have serious potential to promote unionization among municipal contractors across the country. Even the US Chamber of Commerce, friend of bosses everywhere, admitted as much in a 2013 report that nervously assessed the rapid spread of such agreements. If nuts-and-bolts labor victories like this make the mighty Chamber of Commerce afraid, they’re worth paying attention to. As an emboldened left challenges Democratic incumbents in municipal elections across the country, April ushered in a string of early victories for populist and progressive candidates. On April 18, voters in South Fulton, Georgia, elected khalid kamau, a Black Lives Matter organizer, labor activist, and former Sanders delegate backed by Our Revolution, to their City Council. kamau, who describes himself as a part of “a generation of young activists moving from protest to politics,” ran on a platform that aims to reform the local criminal justice system, raise the minimum wage, and open the city’s elections to voters as young as 16. A couple weeks earlier, on April 4, a 28-year-old mechanic and Democratic Socialists of America member named Dylan Parker was elected to the City Council in Rock Island, a small town in western Illinois that sits on the banks of the Mississippi River. A vocal supporter of social-welfare programs like food stamps and an advocate for municipal broadband, Parker has pledged to preserve his town’s “working class” character. And while you’re perusing the electoral scene, pay attention to Philadelphia too, where Larry Krasner, a long-time civil-rights attorney and First Amendment defender, is shaking up a seven-person Democratic primary to be the city’s next top prosecutor. If he wins, Krasner has said he will stop imprisoning people who can’t pay bail, effectively abolish the death penalty, maintain Philadelphia’s sanctuary-city commitments, and prohibit prosecutions based on “illegal stop and frisk” tactics. The bespectacled progressive has been endorsed by national organizations like Our Revolution, Color of Change, and Democracy for America. The primary will take place on May 16. If you have tales of courageous organizing, inspired troublemaking, and strategic movement building that you’d like to share for next month’s edition, please email us at cities@thenation.com.